I began studying astrology while living in Japan. I soon realized that up until then I’d been seeing everything ‘out there’ relative to myself — subjectivity to the hilt. Astrology opened a window onto the world for me — things were unique in there own right. Not only that, astrology offered what appeared to be an objective reason why things were the way they were. 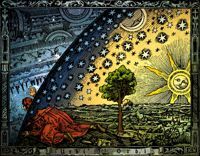 As I dug deeper into astrology, the ‘objective reasons’ stretched credulity. Sure, at the most fundamental level of non-locality, everything is connected. Non-locality seems to parallel chapter 56’s, This is known as mysterious sameness. However, going from mysterious connectedness to the detailed cause and effect of astrology ultimately felt too far-fetched. Astrology began to look more like a symptom of a desperate human need to have answers. In doing people’s horoscopes, it was fascinating how those who believed in astrology ‘bought’ my presentation hook line and sinker. Those who had no pre-belief were never convinced. I began to realize that we only see what we already want to see, which eventually evolved into my sense that we only learn what we already know. I admit this is a very odd notion, but what can I say? I realized that the world I was perceiving in my youth was actually a reflection of what I believed. Now I recognize that everything I perceive is a reflection of, not what I believe, but more of ‘who I am’ — innately, naturally, biologically. Our innate original self determines the beliefs to which we are attracted. I’ve come almost full circle, except that I’ve dropped much of the sensation of being ‘at the center’, and the sense of self-certainty that confers. Oddly, knowing that any belief I have simply mirrors my innate nature removes the heavy burden of ‘self’ responsibility. In other words, being ultra personal helps me not take life so personally. I say, “It is your biology stupid, and not the individual that your illusion of self ego thinks you are”. And to the end of one’s days one will meet with no danger. This only increases as youthful emotion subsides with age and experience. I’d say it was simply youthful emotional insecurity making mountains out of the molehills of belief. If the world we see is simply a reflection of who we are, then Chapter 47 makes more sense. The more we know ‘in here’ the more we know ‘out there’. Accomplishes without having to act. The whole world recognizes the beautiful as the beautiful, yet this is only the ugly; the whole world recognizes the good as the good, yet this is only the bad. Part of our 'problem' may stem from our innate drive toward what is 'good', i.e., success, survival. This lends a certain 'more is better' bias to emotion which then feeds into thought. 'More is better' whether it be “consciousness”, love, money, friends, health… etc. In other words, whatever one values, 'more' is always felt to be better. That particular biological hoodwink causes us a lot of grief in the uniquely civilized circumstances in which we find ourselves. I enjoyed that comment from your elementary teacher. I’m surprised you recall it, and wonder if it was meaningful to kids that age. I’m guessing the instinctive ‘more is better’ becomes more of a problem as we become capable, in adulthood, of piling on more and more. Alas, any thing we feel important becomes a personal “trap”. Extricating ourselves from this is like attempting to touch your finger with your finger, or attempting to see your eye with your eye (using a mirror or another finger not allowed). ‘A sense of ‘important’ (need, desire, lust, etc), is the “trap” living things fall into the moment they are born, and only escape once dead. This “trap” accounts for an ideal common to all religions (as far as I know). The Taoist version goes like this: therefore the sage desires not to desire, and does not value goods which are hard to come by. The ‘goods’ being not only physical things but idealistic goods – perfection of any sort, including a perfection in desiring not to desire. This works kind of like welfare in that welfare works as long as you don’t rely on it to work. As soon as you do, you lose it. First of all, there is a limit to the ‘more is better’ concept. One of my teachers of elementary school once said: “Enough is more than a lot.” It shows the contrary movement of ‘more’. For me, the hidden message has firstly been to be grateful for what I have, if it is enough. Later it shifted to recognize that everything I have is enough and it instilled in me a feeling of abundance regardless any objective measure of quantity. It is about quantity versus quality; a small quantity may represent a lot of quality or a large quantity a small quality. In different circumstance, however, more of the one may just as well represent more of the other. Perception of ‘more’ depends on a personal value system. If quantitatively more does not equate qualitatively more in some situation, then it means that ‘more’ does not equate ‘more’ in every situation. The phrase ‘more consciously’ is, I admit, a not so well-defined concept. Therefore, I would prefer the sense of tuning in that I mentioned in my earlier post. Tuning in has to do with skipping the bulk, but direct for essence. This essence, or the Tao, is nothing physical. Nevertheless, it can be recognized or remembered. In this process of tuning in, there may not be anything measurable that becomes ‘more’ or ‘less’. Indeed, the primary measurement terms ‘more’ and ‘less’ fade. There is just consciousness or awareness and the contradictory movement of every term fades. At that point where contradiction fades, certainly, there is no ‘problem’. So, to value everything for what it is, rather than value it in reference to a (fixed) personal preference, effectively dissolves problems. Becoming aware of the ‘more is better’ trap may actually be helpful to tune in. It certainly helped me. Every less is more of its lack. Every more is less of its lack. The lack of everything is the Tao. The Tao does not lack itself. Part of our ‘problem’ may stem from our innate drive toward what is ‘good’, i.e., success, survival. This lends a certain ‘more is better’ bias to emotion which then feeds into thought. ‘More is better’ whether it be “consciousness”, love, money, friends, health… etc. In other words, whatever one values, ‘more’ is always felt to be better. That particular biological hoodwink causes us a lot of grief in the uniquely civilized circumstances in which we find ourselves. One of the strangest things happens, when thoughts are reflected by the things you recognize. In this experience a secret is hidden. Our perceptions of reality do not so much change, neither do we. The only thing that changes is our awareness of who we are and this goes hand in hand with recognizing oneself in the things around us. Such a way of recognizing oneself is related to remembering, when remembering has the meaning of bringing into consciousness what previously was experienced unconsciously or without recognition. Reality has a way of showing us the same things over and over, in variations, until we recognize it as being part of us. Then, when we detach from it as something desired or undesired, we pass on to the next level of awareness, i.e. living more consciously. The more consciously we live, the less we believe in the reflection we see, but we trust more that it will constantly reflect better who we are. Losing more of the concepts who we think we are, we recognize more of who we really are in the things we see reflected. Time becomes the knob of a tuner with which we tune in to the message of who we are. We don’t need divination ‘tools’ or astrology, we just need to tune in. Maybe the Tao Teh Ching is an antenna? It would mean that it may facilitate tuning in, cutting down tuning time?